Legacy. It’s the buzzword among Oklahoma Baptists this year. Giving It All Away…And Getting It All Back Again by David Green with Bill High is a very timely message. 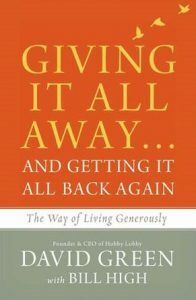 Published by Zondervan and released in April 2017, it’s not only about living generously, it’s also about legacy. David Green, one of Oklahoma’s own and founder and CEO of Hobby Lobby is listed on the Forbes 400, the Forbes magazine elite list of the wealthiest people in America. Green believes that true wealth is based on faith, strong family and generous living. In Giving It All Away, Green humbly shares the journey of Hobby Lobby’s 40-year history, his principles for running a successful business and passion for leaving a legacy. Legacy not only includes wealth, the visible part, but the invisible qualities of faith, commitment, hard work and generosity. Green sees himself at the point in life where he is transferring the baton to the next runner in the race, what he refers to as “generational handoff.” He believes it is his responsibility to prepare for the legacy transfer and teach the younger generations to prepare for their own legacy. The story of Hobby Lobby, the largest privately-owned arts and crafts retailer in the world, is fascinating. Green tells of his humble beginnings of making picture frames with his wife in his garage. He recounts the Supreme Court case Burwell vs. Hobby Lobby in which Hobby Lobby successfully sued the federal government over the mandate that private companies must provide for potentially life-terminating drugs against their religious convictions or pay severe fines. He shares the story of the company’s struggle in the 80’s which almost brought the company to bankruptcy and how they regrouped in order to move forward with great success. Gleaning from years of wisdom, Green believes that everything he has belongs to God and that Hobby Lobby is owned by the Lord. This is foundational when making decisions which are made as a family. He gives a practical system of giving and explains his company’s detailed decision making process which includes where to give and how to give. Hobby Lobby currently gives up to 50 percent of its profits. He candidly writes of his uneasiness with the traditional approach to passing on wealth and explains his family legacy plan, the Green Stewardship Trust, which will protect the company through the generations and define who will manage the trust and for what purposes. I highly recommend Giving It All Away. Green’s great faith, practical advice and passion will motivate others to be generous, good stewards and be intentional about their legacy. It’s a short, well-written and enjoyable read. As a frequent Hobby Lobby shopper, I am encouraged knowing a portion of my dollar goes even further than the items in my shopping bag. As a matter of fact, my shopping bag will be even larger now. It’s not too late! Start now and plan your legacy!